Despite considerable improvement since the turn of the century, India has one of the highest levels of electricity transmission and distribution (T&D) losses in the world. T&D losses represent electricity that is generated but does not reach intended customers. India's T&D losses are almost 20% of generation, more than twice the world average and nearly three times as large as T&D losses in the United States. Electricity losses are the result of technical inefficiency and theft. Technical losses occur because of the resistance of wires and equipment as electricity passes through. Some loss is inevitable, but in places with good technical efficiency and low theft, T&D losses generally range between 6% and 8%. Most of India's T&D losses result from theft, which occurs when consumed electricity is not accounted for. Electricity is typically stolen by bypassing or tampering with the meter, or by bribing utility meter readers or billing agents. Over the past several years, India has made capacity additions and efficiency upgrades to its transmission grid in an attempt to lessen technical losses. In 2009, the National Load Dispatch Center began supervising regional load dispatch centers, scheduling and dispatching electricity, and monitoring operations of the national grid. By the end of 2013, each of the country's five regional grids was interconnected to operate at a synchronous frequency in an effort to more efficiently transfer power from generation sources to load centers. India has also more than doubled the mileage and capacity of high-capacity, high-voltage, direct-current lines since 2002, as these lines experience fewer losses over long distances than alternating-current lines. In 2014, the Indian government initiated the Integrated Power Development Scheme to further strengthen urban distribution networks with information technology-based systems to meter distribution transformers, feeders, and urban consumption. The National Smart Grid Mission works with state distribution companies and financing agencies to plan advanced communications grid projects. Many of India's utilities also lose significant electricity-related revenue because of poor collection efficiency. Commercial losses occur when utilities are unable to collect customer bills, either because customers are unable to pay or because the utility is not reimbursed for state-mandated subsidies. The Ministry of Power launched the Restructured Accelerated Power Development and Reform Program in July 2008 specifically to reduce both technical and commercial losses. Loans and grants were provided to utilities with the goal of establishing baseline data, setting up information technology-based energy accounting and auditing systems, establishing consumer service centers, and upgrading the distribution grid. Supervisory control and data acquisition systems have been installed to monitor the energy flowing through power lines and substations. After a government financial bailout of state distribution companies in 2011, the Indian government approved a utility restructuring plan and set up a $1.3 billion National Electricity Fund to promote investment in the power distribution sector. The National Electricity Fund financially rewards companies that surpass targets to reduce technical and commercial losses and that meet state regulatory goals. Additionally, many of India's state governments have now adopted new regulations and technologies to improve tariff billing and collection practices. To help combat losses due to theft, government programs have funded the installation of information technology-based and tamper-proof energy monitoring, metering, and accounting systems and equipment. Source: U.S. Energy Information Administration, based on India Central Electricity Authority and India’s Power Finance Corporation Ltd. 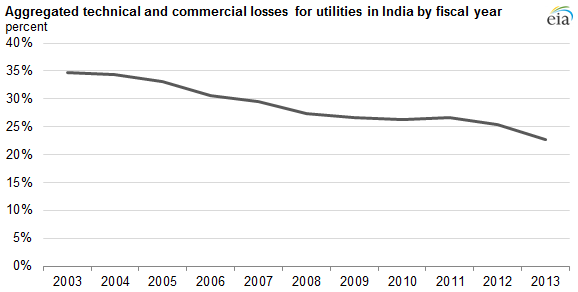 While loss levels are still high, electricity losses in India are decreasing. The Indian Ministry of Power released its evaluation of 40 power distribution companies in August 2015, which reported that 21 power distribution companies showed a reduction in their technical and commercial loss levels during the 2014 fiscal year compared to the previous year's levels.